"Now with recommended gear ratio's"
Click image below to get more details on that motor! Parma stock Death Star 16D. The most commonly used motor on the market. Great for novice and Gr.10 Racing! Parma Rotor Blue Printed Balanced 16D. A common Blue Printed motor which is the same specks as a 16D as far as size, diamature, armature size etc. 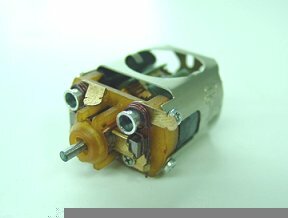 but the Armature is an American made arm, balanced, higher timing and much better quality. The can is also a little lighter and comes with adustable timing. Same as the motor above but lighter and a more open can for top end speed which makes for faster overall times. This is the most common used motor on the USRA circuit! Parma stock Super 16D. Another common stock motor. It is very close to the balanced 16D motors as far as speed and times but a different class then the stock 16D as the armature is shorter and less turns of a thicker wire and also balanced. Mick A/Kelly Blue Printed Super 16D. Same as the motor above but lighter which makes for faster overall times. Not a real popular C-Can motor even though pretty fast the Blue Printed S16D motor is faster down the straight but the light weight Kelly C-Can will beat it in the corners. A very popular motor in the So Cal Racing (GT1 Class) About equal to the Blue Printed S16D motor but lighter which gives it the edge in the corners so overall faster. The C-Can motors are lighter and smaller then the D-Can motors and have stronger magnets which gives them better handeling, brakes and punch out of the corners. They are also more expensive but the added power, lightness and speed makes them worth it. One of the more popular motors for GT-12, Box Stock 12 (B12) and Drag Racing. It is a very fast motor and not recommended for the beginner unless in a wing car (B12) or a drag car. A popular motor in many tracks and the National USRA. Near the speed of a Gr. 12 motor (see below) this is the fastest motor one should instal in a stamped steel type chassis, i.e. ; Parma Flexi's, Champion Turbo Flex, Mossitti Titan, etc. Besides the Top Gun Motor this is the fastest C-Can motor! It is basically C-Can Gr. 27 as it has the same wire and winds as a Gr. 27 but made for a C-Can. Recommended for a Gr. 20 winged car and a drag car only. This is just a brief description of the D and C-Can motors. Their are more choices of brands especially in the C-Can motors. We carry Pro Slot, Mura, Camen, RJR and also they come in a stock version in some of the classes of C-Can motors but are not to widely used. We also have not covered the Cobalt motors which their are three basic classes (Cobalt 12, Gr.27 and Gr. 7 Open) By the time you are ready for the cobalt motors you should know which ones are faster then the other anyway. If you have any further questions or hopefully this has helped you in some way please feal free to email us and let us know.